Whether you have played a course 20+ times a year or looking to play the course for the first time, insights from an insider can help enhance your golf experience. 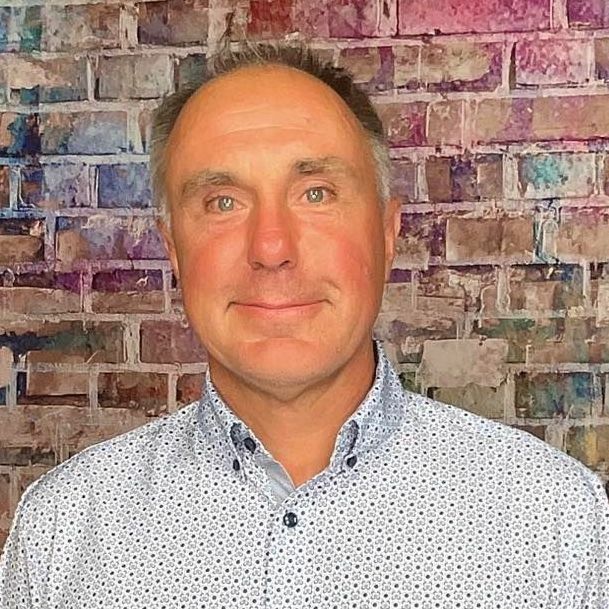 Below is an interview with Philip Licata, PGA who shares some valuable tidbits about the course, memorable holes and must eats and treats at the 19th. The primitive trails along the rugged northern ridge of the Blue Ridge Mountains seemed eerily familiar to Ellis Maples and his son, Dan, as if left behind solely to inspire their vision for a golf course. For months, the two tracked through 1,000 acres of thickly wooded hillsides, part of the land once known as The Big Survey. "We would come out of those woods up there at the end of the day, knowing we had walked the whole golf course," Dan Maples recalls. "We could almost find the whole golf course already up there on those old trails." 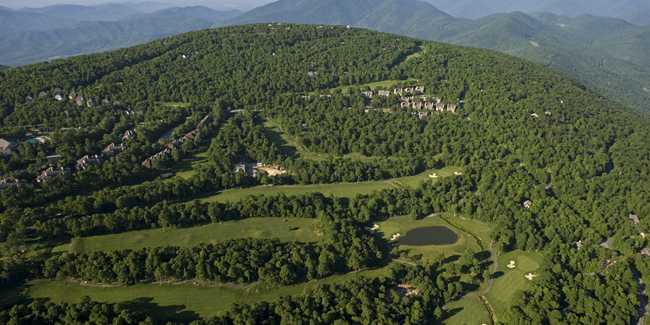 For the past 25 years, golfers have found their way up the mountain to those trails, which in 1976 were transformed into Devils Knob Golf Course, the Mid-Atlantic's award-winning destination at Wintergreen Resort. Every year, golfers escape the summer heat at Devils Knob, which at 3,850 feet elevation is consistently 10 to 15 degrees cooler than the nearby cities, normally with mid-day temperatures in the 70s and 80s. Devils Knob is the highest golf course in the state, providing majestic, 50-mile views of the Shenandoah and Rockfish Valleys. The thin air provides some extra carry on most shots, but while you may have to change clubs more often, at Devils Knob you wont feel like you need to change your shirt every hole. Which, during the summer, is a very cool thing. Perennially ranked as one of Virginia's best courses, the par 70 plays to a maximum of 6,712 yards from the longest of its four sets of tees. Tight doglegs, sloped fairways and devilishly sloped greens create challenges from start to finish. Still, Devils Knob is a charming experience, attractive to various levels of golfers. Built largely on rock formations, Devils Knob features numerous natural stone outcroppings that give it a unique character. Its varied hole sequencing includes three par 3s and a pair of par 5s on the front nine - including the par-5 seventh, which plays to 600 yards from the back tees. 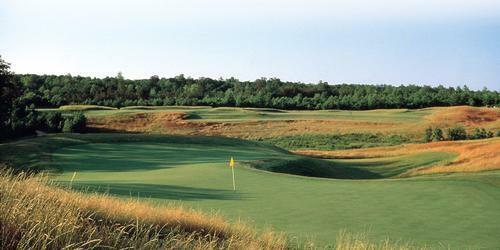 The back side has only one par 5, but its mixture of doglegs and dramatic elevation drops create a distinct flair. The Devils Knob clubhouse is a spacious 17,000 square feet, complete with locker rooms, upscale dining areas and a full-service golf shop that features top-of-the-line equipment and apparel. The first of 17 courses Dan and Ellis Maples built together, Devils Knob was a complicated project. The acute changes in elevation were like nothing the Maples family - or anyone else in the golf course construction business - had attempted to negotiate. Indeed, Maples said he and his father were told by several of their more famous contemporaries that it was foolish to try to build a course on the top of the Blue Ridge Mountains. "It was pretty treacherous," Maples said. "But it worked out beautifully." When Ellis Maples designed this 18 hole gem, the highest golf course in Virginia, his challenge was to enhance its stunning Blue Ridge Mountain setting. Sitting at an elevation of over 3,800 feet, players leave Devils Knob golf course remembering narrow fairways, excellent turf conditions and unsurpassed vistas. 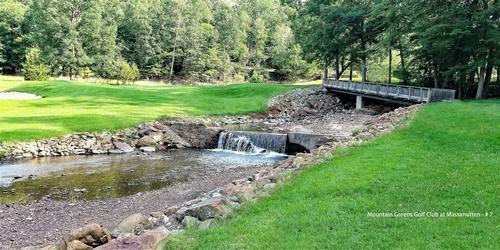 Typically 12-18 degrees cooler even than its sister golf course, Stoney Creek, Devils Knob provides Virginia's coolest playing conditions throughout the summer and the most dramatic mountain foliage backdrop throughout the fall. If you are searching for a true mountain golf challenge, Devils Knob golf course is a "must play." Demanding accuracy from tee to green, what Devils Knob lacks in length, it makes up for with difficulty. Tight doglegs, sloped fairways and devilishly sloped greens create a challenge from start to finish. Ranked as one of Virginia's best courses, the thin air provides some extra carry on most golf shots and the altitude creates an escape from the summer heat, normally keeping midday temperature in the 70s and 80s. The course has received numerous awards and we are most proud about how many competitive players enjoy playing the course. Devils Knob signature hole â¬" Hard to pick just one. We have multiple elevated tee shots providing stunning views and club selection challenging. The par 3 #17 has a split elevated tee to a well bunkered green protected by a pond in front. 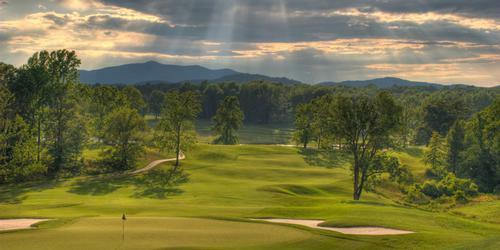 Hole #16 has an elevated tee with beautiful views of the mountains in the distance. It looks like the tee shot flies forever. After finally landing in the fairway, your ball will run down and to the left with the terrain leaving a short iron to the green guarded by a front left bunker. Normally an easy task except you usually have a downhill lie with the ball above your feet making club selection and solid contact a challenge. Best play off the tee is a club that you can find in play after your tee shot, you may not need driver because of the unique design of the hole using the natural terrain of the mountain. The Devils Grill offers indoor and terrace dining with views of the players finishing, playing up the 18th fairway and green. Lunch is served daily, dinner Wednesday â¬" Sunday during the season. For reservations, call (434) 325-8100. The signature Devils Knob Cobb and The Devils Club are a couple favorites to enjoy after your round!